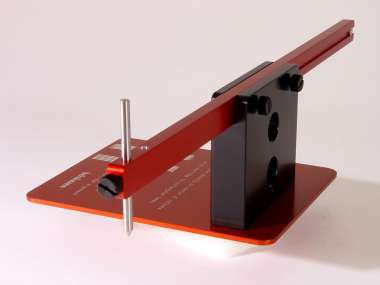 With our method and tooling the protractor allows for a precision alignment of the cartridges and tone arm but it still requires very careful use ofthe protractor to achieve best results. Geometrically the protractor uses the IEC rules for the both null points : 66.04 and 120.9 mm, in following given as 66 and 121 mm. There have been many discussions about different possible null points, but here we will not go into this. Evaluations have shown that the IEC rules are good and lead to good results. One special thing with this protractor is the offset between the guideway of the bar and the hole for the spindle. This offset is half of the difference between outer and inner null point 121 – 66 mm. Due to mirroring over this offset the outer null point is equally adjusted by only adjusting the cartridge precisely on the inner null point. With this protractor there is no interpolation necessary, which makes it fast to precisely align the cartridges and tonearms. With interpolations and even more by finding the pivot by simply looking along a line on the protractor, there occur too many deviations, at least added by inprecise printings of the simple protractors. A stylus contacting the record with only a few thousands of a millimetre needs an extraordinary precise aligning. Sometimes the correct alignment can be limited by the mounting slots in the headshell of the tonearm. In this case the tonearm has to be moved to a different distance between spindle and pivot. 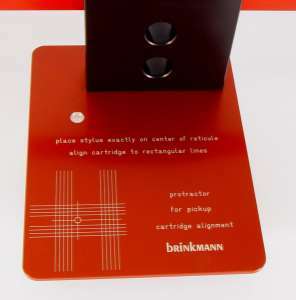 It has to be moved so that the correct alignment of the cartridge can be achieved given the size of the headshell slots. Usually this is only possible by eccentrically drilled tonearm bases that can be turned. Or the arm itself has a slide which makes the arm able to be moved. At least this will alter the effective length of the tonearm, maybe different from the given length mentioned in the datasheet of the arm. This is OK as long as the cartridge is aligned properly. As the bar of the protractor will follow this movement of the pivot (keep the protractor needle always on the pivot), and thus the reticule will follow the new geometric situation the protractor will always show the correct aligning point of the cartridge. 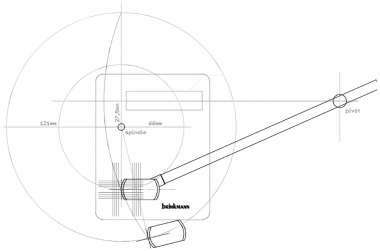 In this way it is very easy to find the correct arm mounting point and the correct cartridge mounting point in the tonearm. Maybe the situation shows that the cartridge has to be mounted a little at a different angle than the headshell occurs. This is OK as long as the cartridge is mounted along the grid lines on the protractor. The protractor is machined with most possible precision. All machining steps of the ground plate and the guideway of the bar were performed in one set up on the CNC machine. This one set up process avoids any error caused by machine fixtures We first mount the black block on the base plate and then the spindle hole is drilled, the guideway for the bar, the reticule and it’s grid of lines are machined. During this process only the tools of the CNC machine are changed but the protractor is not taken from the machine until all is done. This results in a precision of better that a 0.01 mm.